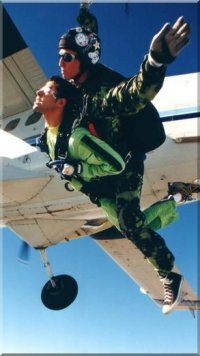 Skydiving Las Vegas - Thrill is Not Just in Casinos! Home / Skydiving Las Vegas – Thrill is Not Just in Casinos! What’s More Exciting Than Gambling in Las Vegas? Skydiving! Let’s face it, if you’re in Las Vegas you’ve probably come for a fun and unforgettable vacation. Vegas thrills are not just in the casinos, it’s an awesome skydiving city as well. Treat yourself to a spectacular airborne view of Lake Mead, the might of the Hoover Dam and the winding Colorado River as you skydive the Las Vegas skies! A Las Vegas Skydiving adventure will be a truly unforgettable experience and you can rest assured, you will be jumping with some of the best professional skydiving instructors at Vegas’ renowned skydiving sites. ‣ You can skydive all around the United States but in the arid Las Vegas, Nevada region, you will almost never have to worry about dangerous weather and climate conditions for skydiving. ‣ With about 300 sunny days in a year, skydiving at Las Vegas is almost guaranteed clear skies with year round sunshine. This means you have a clear view of the surroundings and the drop zone and there will be no delays or cancellations for your skydiving adventure in Vegas. ‣ Nevada has a very mild winter season that remains ideal for skydiving. While winter skydiving is impossible in many US cities, Las Vegas has daytime highs around 60 °F even in the middle of winter. Skydiving in Las Vegas during the winter is as fun and exciting as any other season due to the mild desert climate. Las Vegas is the most popular vacation city and also the most populous in the state of Nevada. Appropriately known as “The Entertainment Capital of the World”, the city is internationally recognized for its gambling establishments, shopping, five-star hotel accommodations, fine dining, world class shows, and other great experiences. Not surprisingly, skydiving in Las Vegas is not the only unforgettable adventure here. 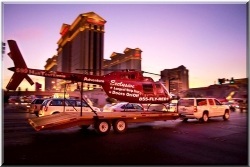 Other fun one-time airborne adventures include helicopter and airplane flight lessons, Vegas helicopter tours of the city, glider flying, and of course signature Las Vegas air balloon rides. For the more adventurous souls, there are even air combat adventures where you will actually be flying real fighter planes through the skies in combat maneuvers and simulated dogfights, supervised by trained fighter pilots! If real Las Vegas skydiving seems too intense for you, there are also extensive Vegas indoor skydiving facilities. Vegas indoor skydiving sites use powerful fans to mimic the fall of skydivers towards the earth and provide a floating freefall experience that can be just as exciting, although without the awesome desert vistas. Also, Vegas indoor skydiving is offered directly within the heart of the Las Vegas strip, making it more convenient if you are short on time. Whether you end up choosing to go skydiving in Las Vegas or opt for another experience, all of these ‘once-in-a-lifetime’ airborne activities will guarantee you a thrilling and unforgettable experience.